The trout lilies (Erythronium americanum) have started to bloom in the Secret Garden. They are plentiful in my current Secret Garden and in the woods of my former home. 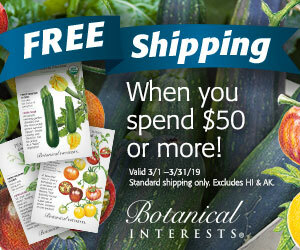 You would think that a native plant that is so plentiful would be easy to grow, but that’s not so. Well, it grows in the garden well enough, but it can be a shy bloomer. When you plant trout lilies, this is what you hope to see. This is what you often see instead: a whole bunch of single leaved plants. A beautiful flowering patch of trout lilies. I have dug a flowering plant from our woods and planted it in my garden, and it reverted to a group of single leaved plants. I discovered this trout lily growing at the base of a peony the first spring in our new garden. It has gotten bigger and better every year, and this year there are a bunch of single-leaved plants around it. Are they seed grown from the mother plant, or stoloniferous extensions? I’d have to dig it up to find out. But from my own observations, I’d vote for growing conditions being the deciding factor concerning flowering. 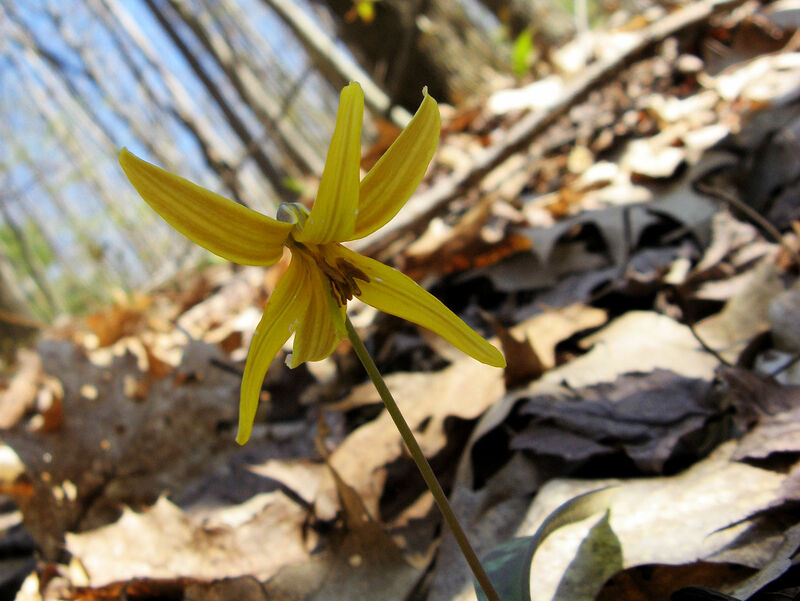 What conditions encourage the trout lily to bloom? No one knows. Some have speculated that they bloom better in confined spaces, such as when they are growing on top of a rock. Cullina has tried that and says it didn’t seem to make a difference. Perhaps observing the same patch over many years, one would start to develop a theory about it. I am content to let it be one of the mysteries of the plant kingdom. I no longer try to grow them in my garden, but when they show up there, I certainly don’t weed them out. As a matter of fact, there is a large patch of them in our front lawn, under the drip line of the maple that was recently cut down. They are all single-leaved plants, but I wouldn’t expect otherwise since they get mowed every year. No, I don’t try to grow them, I just enjoy them in the woods. I have that luxury. 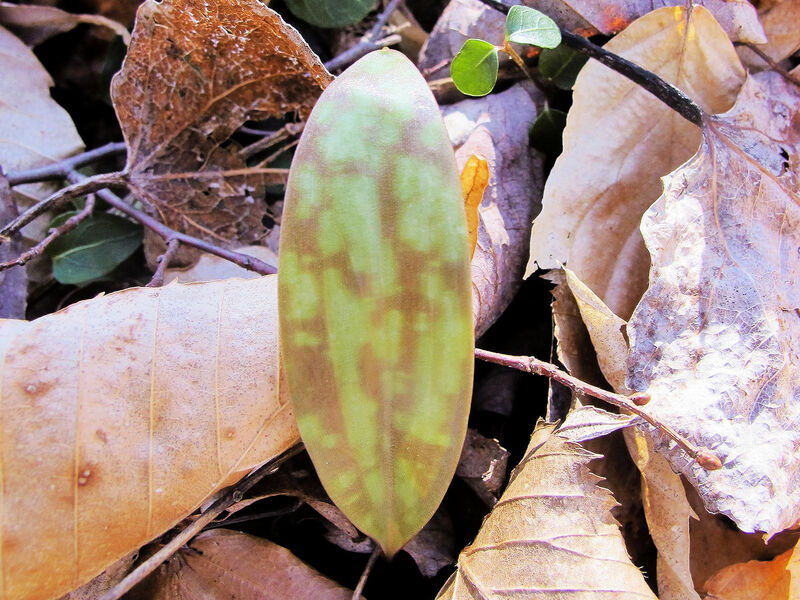 Trout lilies get their name from the mottled leaves, which supposedly look like the skin of a trout. I don’t believe I have ever seen a trout in the flesh–only in the grocery store–so I can’t confirm this. They reputedly bloom when it’s good trout fishing, but I don’t know anything about that either. I do know what lilies look like, and the flowers do resemble lilies. Their other common name is dog-tooth violet. The bulb is supposed to be shaped like a dog’s tooth, but why call it a violet? It’s not violet colored or violet shaped. [Shakes head] Sometimes common names don’t make much sense. 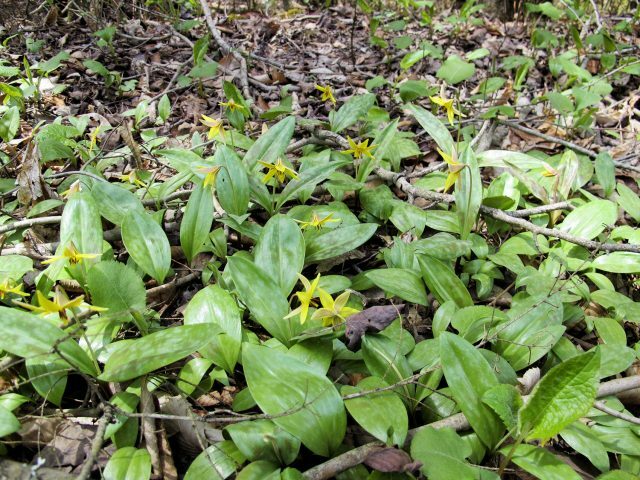 I’m sticking with trout lilies. If you’ve got a blooming patch growing in your garden, please share your secret of success (or confess it’s dumb luck) in the comments. 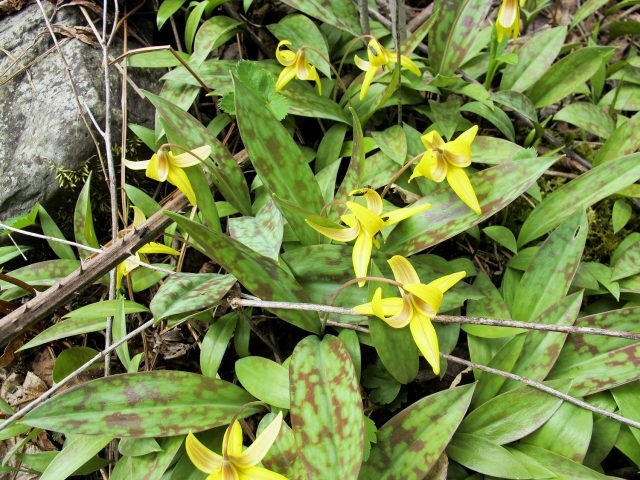 I know rock gardeners who can coax rare alpine treasures into bloom, but have been stumped by trout lilies. P.S. 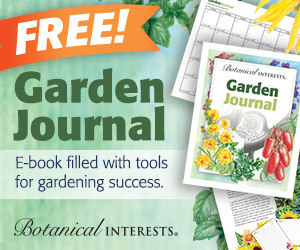 There’s still time to sign up for Kerry Mendez’s Jaw-Dropping Shrubs webinar, which goes live this Thursday. Remember, even if you can’t watch it live, you will get to download it to watch later. Click here for more details. Great article! I have a large clump in my shady garden in full bloom at the moment. (I live in a large city). The bulbs were purchased and planted a few years ago but this is the best showing I’ve ever seen. I honestly think it’s just dumb luck, I haven’t disturbed them, just left them alone. Trout lilies spread with the help of ants. 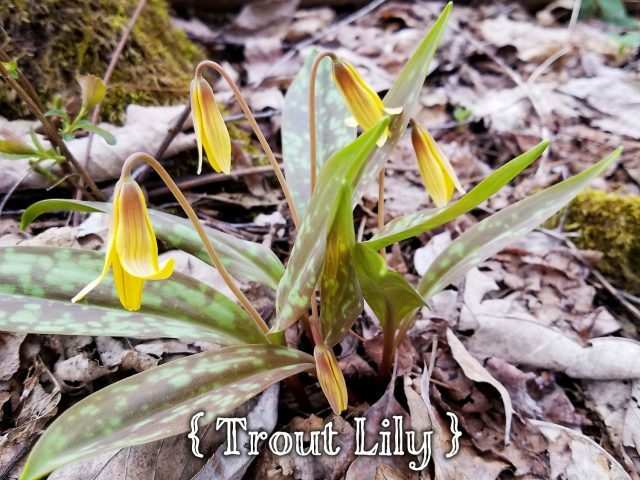 Trout lilies are pollinated by ants, and ants bring the seeds with their nutrient-rich coating back to their colonies as food. Afterwards, the seed itself is discarded and grows into a bulb next year. What a sweet and interesting wildflower. I was unaware of the challenges that come with growing trout lilies. You must love a good challenge. I have a small patch of trout lilies which bloom every year. I planted purchased bulbs many years ago. This year the emerging leaves were nibbled before I got the Liquid Fence spayed, but the flower buds survived. Also this year a second group appeared about 5 feet away, perhaps helpfully transplanted by the chipmunks and/or squirrels. These are not in a woodland setting and get full sun ( when we have sun) through about 2 PM. Thanks for all this info. I have a clump of E. albidum from Seneca Hill that produces flowers but now I will have to go look at the leaves once it stops raining. I planted a few different varieties last year and have seen single and double leaves but virtually no flowers. I think I will quit while I am ahead and just let them do what they will — or won’t! I have a pink Dutchman’s Breeches from Seneca Hill that comes back every year but never gets significantly larger or spreads. Fascinating post. Trout lilies bloom wild in the woods, spotted here and there. We don’t have any large clumps and I’ve never noticed single versus double leaves. I need to be more attentive. Mine seem to be single leafs. I will try some in another spot. Where I only had one leaf, I now have three. I just planted it last year (bare root). I am happy to say that the Dutchman’s Breeches I rescued from our lake house driveway came back. 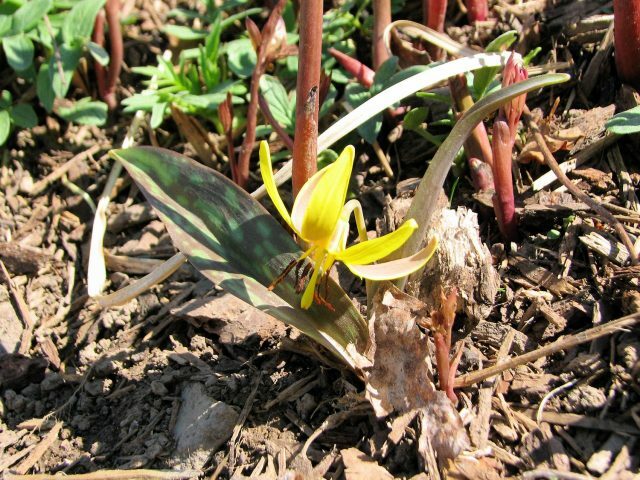 It is planted in the same garden area as the trout lily. I read they (the Breeches) are very tricky to transplant and grow. I bought some Dutchman’s breeches from Seneca Hill Perennials (or was it squirrel corn?) and they came back every year but didn’t multiply. When I moved them over here, it set them back. I haven’t yet seen them this year. When I was little (30+- years ago) we called them adder tounge. 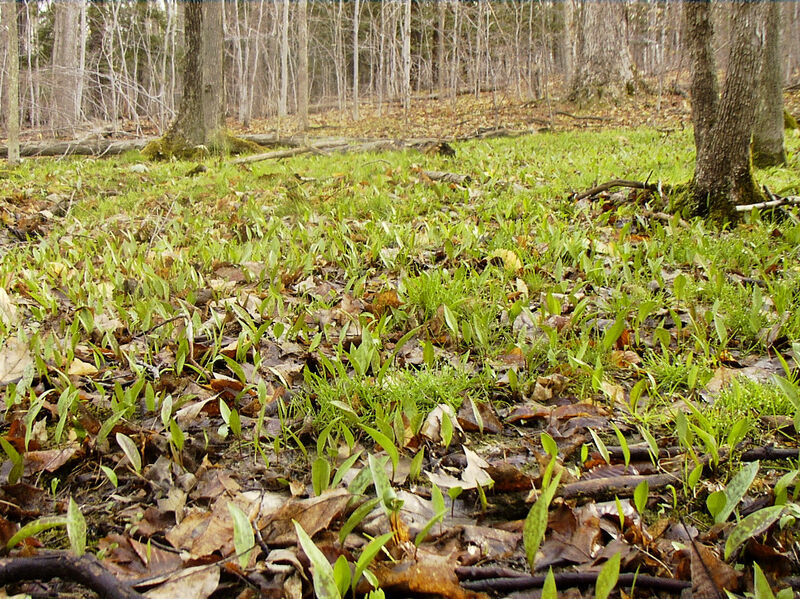 We would eat the leaves when we were out picking morale mushrooms and ramps. My mom would pick some and dry it for a salve. Have you ever eaten any? No, Rachel, I have never eaten them, and I have never read that they could be eaten. But I just googled it, and Wikipedia says the leaves and bulbs can be cooked and eaten. Did you enjoy them? Were they tasty? They are definitely unique! I recently found a patch and weirded out my husband by eating some. They are kinda slippery, like purslane. They have a strong taste but it doesn’t linger. I have a spread out bunch of plants in my meadow by shear dumb luck….I had a patch that naturally occurred at the base of a large tree in my old garden but they never bloomed. In my newer garden (now here 12 years), I discovered the trout lilies growing here and there in the back of the garden where I have my meadow…the land used to be a wet woods until it was cleared for housing. So I was shocked to see they survived here after all the clearing and grading. It is very sunny in the meadow in spring and the soil is clay…so I am dumb founded to know how they are growing, flowering and spreading. I do hope they continue to spread and grow into a thick patch.